Enter to win a brand new car, courtesy of Ford. The #unminivan has seven-passenger seating, comes in a variety of colors, can tow up to two-thousand lbs, and thirty gallons per mile on highways. This sweepstakes is open to the continental United States and D.C.. It ends in December, so you have plenty of time to enter! The car is actually called the Transit Connect, and this sweepstakes does have some limitations. You need to be eighteen or older to enter, with a valid driver’s license. It takes three easy steps to enter. First, choose one of the five benefits that the Transit Connect offers that you like the most. Second, watch a quick video clip about the benefit you chose. Third, click the “Register Now” button. You can log in with Facebook to invite your friends, but it’s not necessary. You’ll need to enter your name, address, phone number, and e-mail to enter. 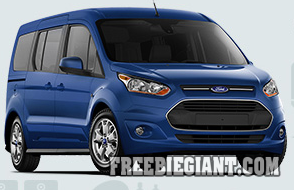 Click here to enter for a chance to win the Ford #Unminivan contest.